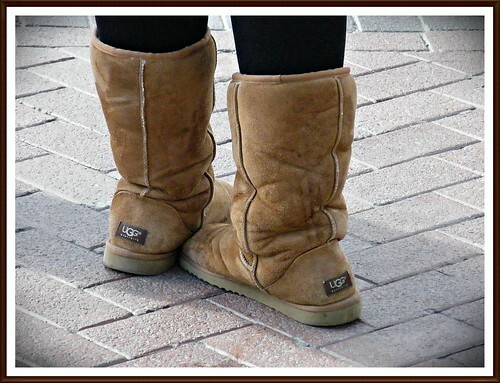 As announced in GM’s ANC Preview last week, Ugg Australia will be moving to the old Diesel location on Wisconsin. GM’s already had his say about his take on the popular boots, but he will add that the store design presented last night was down right tasteful. And it’s this balance of the sublime and the profane that seemed to define last night’s meeting. DDOT came by to update the community on their plans to rehab the trolley tracks on O and P Streets (actually, technically these are streetcar tracks since trolleys are streetcars that use overhead wires, which weren’t used on these streets). The Sublime: What these streets will look like. Eventually. The tracks will be ripped up, repaired, and replaced with a newly secured foundation. The cobblestones will be ripped up, cleaned up, and replaced. The tracks will be flush with the cobblestones, hopefully preventing any more dangerous driving conditions. The sidewalks will be repaired and the trees protected or replaced. The Profane: It’ll take a long time to finish. DDOT is estimating 18 months. GM is estimating at least two years. During which travel will be severely disrupted on those streets. Safeway came by to update their voluntary agreement regarding their beer and wine sales. They want to be able to sell beer and wine throughout the store (sort of like how Whole Foods does) and sell it from 9 AM to 10 PM seven days a week. The Sublime: Safeway will be offering a higher-end beer and wine section than it did in its old building. The extra hour will probably help out some last minute planners. Speaking of hours, they plan to keep the store (and its pharmacy) open 24 hours seven days a week. Oh, and they found two tenants for the first floor retail! The Profane: The tenants are a cell phone store and a nail salon. The new pizza place on 31st, Il Canale, is proposing to rehab their shabby exterior. The Sublime: As it is now, the exterior has been through the wringer. The old building has had a lot of faux historical elements added that confuse its design. Plus the windows have shutters that don’t fit. The new design will address all of that and add a broad awning. The Profane: The awning will be stainless steel. (Actually the more GM thinks about that, the more he likes it. That part of town was historically Georgetown’s industrial section. A metal awning may invoke that nicely). The owners of Crepe Amour came by to detail some of their changes since converting from Amma’s Vegetarian Kitchen. They’ve become a French crepe restaurant, building off their past of making southern Indian-style crepes. The Sublime: They want to stay open 24 hours, selling crepes all night long. The Profane: They want to stay open 24 hours, selling crepes all night long to the type of people who want to eat crepes at 3:00 AM. After the Philly Pizza fiasco, there is not much appetite in that part of Georgetown for another late-late night option. Robberies and burglaries were up in March. Thankfully two of the five robberies have already been solved. And please, do not hesitate to dial 911 when you see anything suspicious. Forget what you were told when you were young about not dialing 911 unless it’s an emergency. You won’t get in trouble. If you see something, say something, by dialing 911. Rose Park and Hardy School farmers markets will start up again the first week of May. There will be a tree forum 6:00 PM on May 5th at the House of Sweden for citizens to come and hear about the effort Trees for Georgetown and others are undertaking to preserve our tree canopy. 311 would be the appropriate number to call. Clogging up 911 operator systems with a non-emergency phone call /is/ a problem. No Anna, that’s wrong. But don’t take it from me, take it from Lieutenant Hedgecock of the Second District who said the exact same thing on Tuesday night. If you see something suspicious going on, call 911. Period. Yes, GM, the scheme these days is that any police issue should be directed to 9-1-1. If you need information, a trash pickup, or a pothole repaired (or any other city service other than police/fire/rescue) you should call 3-1-1.